A lacerating polemical memoir from the creator of V.I. Warshawski. 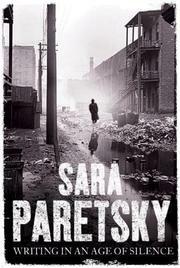 “Every writer’s difficult journey is a movement from silence to speech,” observes Paretsky, who looks here at five areas in which she’s struggled to wrest her individual voice from the command to be voiceless. She begins with her Kansas childhood, spent as the only sister among four brothers and a pair of needy, feuding parents who depended on her mothering and expressed no interest in what she thought or wrote. Next she recalls moving to Chicago at the time of Martin Luther King’s civil-rights ministry, noting that she’s always sided with underdogs because “I’m as needy as the most helpless.” She reviews the impact of Second Wave Feminism on her attempts to imagine women who were neither household angels nor rebellious monsters but simply human beings. She analyzes the dialectic of individualism and community in the hardboiled detective story, tracing Warshawski’s development from a Philip Marlowe in skirts to a heroine immersed in communal ties despite her own independence. And she concludes by surveying current threats to writers’ freedom to speak out, from the increasingly centralized power of market-driven publishers and chain stores to the repressive specter of the Patriot Act. Her own voice, untrammeled by the need of her Warshawski novels (Fire Sale, 2005, etc.) to provide detection, melodrama and shifts in mood, is ardent, angry and almost painfully direct. Readers will overlook occasional factual slips (talking about Raymond Chandler, Paretsky maintains that Carmen Sternwood never killed anyone and transfers the plot of Farewell, My Lovely to The Long Goodbye) in favor of her impassioned plea for the freedom to find one’s voice and her uncompromising indictment of the forces—familial, social, political—that would impose silence. Neither the sentiment nor the passion is new. But Paretsky links different kinds of oppression in compelling ways.